It’s the knowledge era. 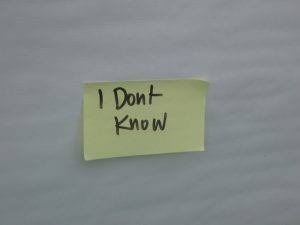 Human beings are used to “knowing” things and if they don’t then there is Google, the precedent of past examples and easy access to genuine experts who can tell us what we want to know. So what happens when we are faced with a scenario that no one is really knowledgeable about? It appears that rather than acknowledge that we really have no clue, we switch unconsciously to our existing confirmation bias. Telling ourselves that we know this cannot be “good” or “bad” because, well… we know that’s how it is, right? How can we not know? What we do know is that there is short term pain. And then we have extrapolations of both positive and negative long term impacts. What we also know for a fact is that it was a gutsy and politically risky move to have taken. One that must have had clearly perceived benefits in the minds of decision makers which outweighed the apparent risks. We must appreciate the sheer guts required to take this risk. However, a key challenge of this exercise has been that no one really knows what those perceived benefits really were. The opaque nature of decision making has left us with many a hypothesis and no way of knowing for sure. One suspects that the narratives of black money, cashless society etc are designed for mass public consumption because of an assessment that the real reasons may be too complex for ordinary people to appreciate. This has led to a mini industry of people trying to second guess what the govt actually had in mind. Again… no one really seems to know. Clearly the impact on black money is likely to be minimal and no long term change in behaviour can be expected unless it is followed up by many more measures. If there are indeed follow up measures in the pipeline then it begs the question why not implement those first in phases, rather than this wide ranging move that affects everyone down to the last man. It appears that black money may be a side-show rather than the core objective, which could also be very sound. But we don’t know. What is also clear is that if withdrawals are limited as they indeed seem to be, then there is a benefit of pushing the parallel “cash economy” (which is not all black) into the formal banking system. This could well set off a virtuous cycle of improving bank liquidity, allowing them to lend more to large infra projects and hence kick starting what is now a stalled economy (which was inherited from the previous govt). Whether the public would have accepted the pain if this fairly reasonable argument was trotted out is a moot point. Theoretically we also know that the basic economic formula of mv=py is being severely tested. For the non economic experts (are there any left?) M is the money supply in an economy, V is the velocity of money or the # of times it changes hands in a year, P is the nominal price level in an economy and Y is the real GDP. If the money supply is suddenly restricted by deliberate means and v, p remain more or less constant, then classical economics says that GDP has to fall. Admittedly this is a rudimentary statement and GDP is a complex outcome of many factors. But it just serves to tell us that this is a real long term risk if the money supply remains restricted, even if we consider it to be a combination of cash and digital transactions. If not enough volume of notes is printed to replace the demonetized currency (which has already been confirmed as a stated objective) and adoption of digital channels does not pick up fast enough to replace the remainder, then we have real contraction in money supply and a possible negative effect on GDP. Ultimately, the feeling on the street seems to be that some action is better than no action. Across the world there is unrest and disaffection with the “status quo” maintained by the elite and India seems to be no stranger to it either. For the “aam admi”, even pain appears to be preferable to continuing in stupor. If the govt is able to channelize this and actually pull long term economic benefits out of the move, then it will go down in history as brave and visionary. In the meantime people will need to be placated after the glamour of the “tough love” has worn off. To do this it is likely that some of the income mopped up through the VDIS schemes as well as an increased focus on PSU disinvestment, may be distributed as largesse in the budget with the 2019 elections kept in mind. When that happens there will again be a slew of “for and against” arguments, without realizing that these are all subservient to a long term outcome that may reveal itself only after 3 or 5 or 10 years. This entry was posted in Current Affairs, Economy, finance, General, Uncategorized and tagged demonetisation. Bookmark the permalink.